1. Play games to memorize the vocabulary. 2. Practice memorizing the vocabulary. 3. Answer questions using the vocabulary. Write the following sentences in Spanish. Do not use a translator. Escribe las frases en español. Wall Street is located (está) in the downtown of (de) New York. Follow (Sigue) the sign to (a) LaGuardia Airport from (de) the city. 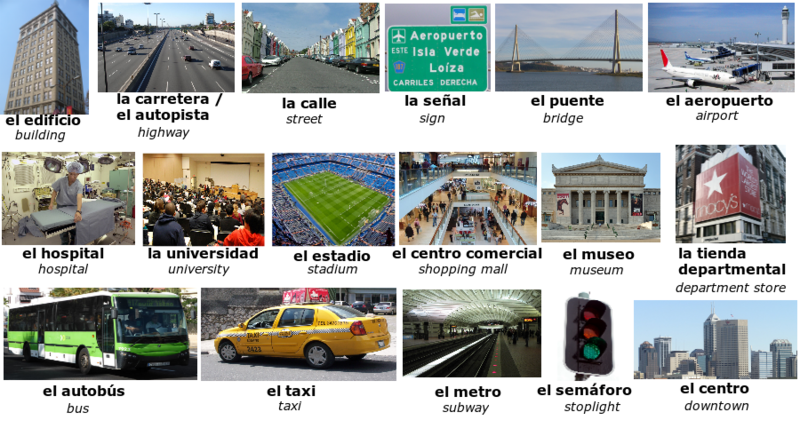 Transportation in the city is frequently by (frecuentemente por) bus, taxi or subway. Usually (Usualmente), there aren't (no hay) stoplights on bridges or highways. The department store is located (está) in the mall. The hospital is close to (está cerca de) the university, but is far from (está lejos de) the stadium.